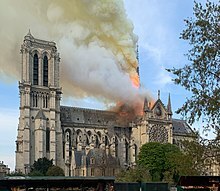 On 15 April 2019, just before 18:50 CEST, a fire broke out beneath the roof of Notre-Dame Cathedral in Paris. By the time the fire was extinguished fifteen hours later, the building's spire and roof had collapsed and its interior, upper walls, and windows had been severely damaged; even more extensive damage to the interior was prevented by the stone vaulted ceiling, which largely contained the burning roof as it collapsed. Many works of art and other treasures were evacuated early in the emergency, but many others were damaged or destroyed. The cathedral's two pipe organs, and its three 13th-century rose windows, suffered little or no damage. No person, firefighter or civilian, was killed. Construction of the cathedral of Notre-Dame de Paris ("Our Lady of Paris") began in the 12th century, using stonework for the walls and vault and wood for the main roofs and spire. The original flèche (spire) lasted until 1383, its replacement was lost in a 1630 fire, and a third was damaged by wind and removed between 1786 and 1791; the spire lost in the fire, made of lead-covered oak and designed by Eugène Emmanuel Viollet-le-Duc, was added in the mid-19th century. The cathedral was listed as part of the "Paris, Banks of the Seine" UNESCO World Heritage Site in 1991. In recent years the cathedral's stonework has decayed significantly, primarily because of environmental pollution. In 2014, the Ministry of Culture estimated the cost of the renovation work needed by the cathedral at €150 million. The fire was primarily fought from the inside, in line with common French fire-fighting practice. Attacking the fire from the outside risked damaging the interior by deflecting flames and hot gases (at temperatures up to 800 °C or 1,470 °F) inwards. Twenty firefighters climbed inside the two towers. Deluge guns from ground-based vehicles were carefully used to douse the fire while avoiding further damage to the building. Following the plans the fire department made for such an emergency, boats were rapidly deployed on the Seine river to pump the water. Firefighters shot water at a lower pressure than usual to minimize damage to the cathedral’s art and architecture. Firefighters focused on saving the cathedral’s towers. More than 400 firefighters were engaged; another hundred worked to evacuate artefacts. Along with the high temperatures of the fire, molten lead falling from the roof also posed a hazard. No one was killed, but one firefighter and two police officers were injured. On 18 April, a judicial police official reported that investigators think a short circuit was the most likely cause. The form that the reconstruction should take has been debated. In the Middle Ages, when many cathedrals burned down, a fire was commonly seen as a request from God for a better cathedral. Cathedrals were generally rebuilt in a more modern and fireproof style. Past reconstructions of Notre Dame have not been historically-accurate restorations. There is discussion of whether to rebuild the cathedral in modified form. Rebuilding the roof with titanium sheets and steel trusses has been suggested; other options include rebuilding in the original lead and wood, or a melding of restored old elements and newly-designed ones. ^ The fire set off alarms around 18:20 in the evening, and the workers normally stop work at 17:00, 17:30 at the latest. ^ Including the Vatican, Queen Elizabeth II of the United Kingdom, Secretary-General of the United Nations António Guterres, President of the European Council Donald Tusk, President of the European Commission Jean-Claude Juncker, Chancellor of Germany Angela Merkel, Prime Minister of Spain Pedro Sánchez, Prime Minister of the United Kingdom Theresa May, Prime Minister of the Netherlands Mark Rutte, President of Portugal Marcelo Rebelo de Sousa,, President of Bulgaria Rumen Radev, President of Romania Klaus Iohannis, Prime Minister of Hungary Viktor Orbán, Prime Minister of Greece Alexis Tsipras, Prime Minister of Canada Justin Trudeau, President of the United States Donald Trump, President of Russia Vladimir Putin, President of Israel Reuven Rivlin, King of Bahrain Hamad bin Isa Al Khalifa, President of the People's Republic of China Xi Jinping, Prime Minister of Australia Scott Morrison, King Mohammed VI of Morocco, President of Egypt Abdel Fattah el-Sisi, President of Ghana Nana Akufo-Addo, and Gérald Caussé, Presiding Bishop of The Church of Jesus Christ of Latter-day Saints, who is from Paris. ^ Issued via the Cathedral's Twitter account under the hashtag, #NotreDameCathedral. ^ "Notre-Dame fire: Millions pledged to rebuild cathedral". BBC News. 16 April 2019. Retrieved 17 April 2019. ^ a b "France vows to rebuild Notre Dame Cathedral after devastating fire — live updates". CBS News. Retrieved 16 April 2019. ^ a b c d e "What We Know and Don't Know About the Notre-Dame Fire". The New York Times. 15 April 2019. Archived from the original on 16 April 2019. Retrieved 15 April 2019. ^ a b El-Bawab, Nadine (15 April 2019). "Paris' Notre Dame 'saved from total destruction,' French fire official says, after blaze ravages cathedral". CNBC. Archived from the original on 15 April 2019. Retrieved 15 April 2019. ^ Okey, Thomas (1919). The Story of Paris. J.M. Dent & Compan. p. 308. Retrieved 18 April 2019. ^ Flynn, Meagan (16 April 2019). "The story behind the towering Notre Dame spire and the 30-year-old architect commissioned to rebuild it". The Washington Post. Retrieved 16 April 2019. ^ "Paris, Banks of the Seine". UNESCO. Retrieved 16 April 2019. ^ Horgan, Rob (15 April 2019). "Notre-Dame fire: Blaze breaks out amid renovations at 12th century cathedral". New Civil Engineer. Retrieved 16 April 2019. ^ "Fire breaks out at top of Notre Dame Cathedral in Paris". The Irish Independent. 15 April 2019. Retrieved 16 April 2019. 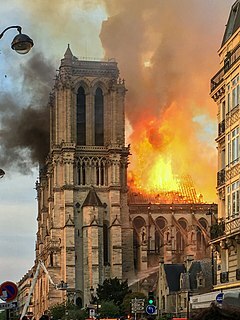 ^ "Notre Dame was undergoing $6.8 million renovation when massive fire broke out". CBS News. 15 April 2019. Archived from the original on 15 April 2019. Retrieved 15 April 2019. ^ Villasanta, Arthur (16 April 2019). "Notre Dame Cathedral Fire Photos: Macron Vows To Rebuild 670-Year Old Church". International Business Times. Retrieved 16 April 2019. ^ a b Vandoorne, Saskya (16 April 2019). "Timeline of Notre Dame alarms emerges". CNN. Retrieved 16 April 2019. ^ a b c d Hinnant, Lori (16 April 2019). "Shock, sadness, but no panic: Minutes that saved Notre Dame". AP NEWS. ^ "Événements pour avril 2019" (in French). Notre Dame de Paris. Archived from the original on 16 April 2019. Retrieved 15 April 2019. ^ a b c d e f g h Quinn, Ben; Quinn, Ben; Elgot, Jessica; Chrisafis, Angelique (16 April 2019). "Notre Dame: experts assess damage after fire extinguished – live updates". The Guardian. ISSN 0261-3077. Retrieved 16 April 2019. ^ a b c d e f g Nossiter, Adam; Breeden, Aurelien (15 April 2019). "Notre-Dame Cathedral in Paris Catches Fire". The New York Times. ISSN 0362-4331. Archived from the original on 15 April 2019. Retrieved 15 April 2019. ^ Hinnant, Lori; Petrequin, Samuel (15 April 2019). "Massive fire engulfs beloved Notre Dame Cathedral in Paris". AP News. Retrieved 16 April 2019. ^ a b c "Notre-Dame: Massive fire ravages Paris cathedral". BBC News. 16 April 2019. Retrieved 17 April 2019. ^ a b c d e f Breeden, Aurelien; Peltier, Elian; Alderman, Liz; Pérez-Peña, Richard (16 April 2019). "Notre-Dame Attic Was Known as 'the Forest.' And It Burned Like One". The New York Times. ^ a b c d "Six questions sur l'incendie de Notre-Dame de Paris" [Six questions about the fire of Notre-Dame]. Le Parisien (in French). Retrieved 16 April 2019. ^ a b Berlinger, Joshua (16 April 2019). "Why the Notre Dame fire was so hard to put out". CNN. Retrieved 16 April 2019. ^ a b Capps, Kriston; O'Sullivan, Feargus (15 April 2019). "How Catastrophic Is the Notre-Dame Cathedral Fire?". CityLab. Retrieved 16 April 2019. ^ Berlinger, Joshua (16 April 2019). "Why the Notre Dame fire was so hard to put out". CNN. Retrieved 16 April 2019. ^ Navarro, Alyssa (17 April 2019). "French Firefighting Robot Colossus Helped Save Burning Notre Dame Cathedral". Tech Times. Retrieved 17 April 2019. ^ Hjelmgaard, Kim; Rosman, Rebecca; Garrison, Joey (16 April 2019). "'The fire is out': Paris firefighters succeed after 12-hour battle to extinguish Notre Dame Cathedral blaze". USA Today. Retrieved 16 April 2019. ^ Hinnant, Lori (16 April 2019). "Shock, sadness, but no panic: Minutes that saved Notre Dame". AP News. Retrieved 16 April 2019. ^ "'Significant fire' underway at Notre Dame Cathedral in Paris". Euronews. 15 April 2019. Archived from the original on 15 April 2019. Retrieved 15 April 2019. ^ a b "How the Notre-Dame Cathedral Fire Spread". The New York Times. 15 April 2019. Retrieved 15 April 2019. ^ a b c Lapin, Tamar (15 April 2019). "Photos show center of Notre Dame cathedral miraculously intact". New York Post. ^ Prior, Ryan (15 April 2019). "The entire wooden interior of Notre Dame Cathedral has been destroyed". CNN. ^ a b c d "Incendie de Notre-Dame de Paris : ce qui a été perdu et ce qui a été sauvé". Le Monde (in French). Agence France-Presse. 16 April 2019. Retrieved 16 April 2019. ^ Sasuke (15 April 2019). "Notre-Dame de Paris : toute la charpente en feu, la flèche effondrée". Maliactu (in French). ^ Kamin, Blair (15 April 2019). "Why people wept as Notre Dame Cathedral burned". Column. Chicago Tribune. Retrieved 16 April 2019. ^ "Notre-Dame fire: Treasures that make it so special". BBC News. 16 April 2019. Retrieved 17 April 2019. ^ Gill, Joshua (15 April 2019). "Why Couldn't Firefighters Douse The Flames Of Notre Dame Cathedral?". The Daily Caller. Retrieved 16 April 2019. ^ "NOW: French official says "both towers of the cathedral are safe" and the fire is cooling". CNN. 15 April 2019. Retrieved 15 April 2019. ^ Hignett, Katherine (16 April 2019). "Notre Dame "miracle"? Rose windows' stained glass appears to have survived savage blaze". Newsweek. Retrieved 17 April 2019. ^ White, Sarah; Pineau, Elizabeth (16 April 2019). "Notre-Dame's famed rose window spared but blaze harms priceless artworks". Reuters. Retrieved 17 April 2019. ^ a b Guyonnet, Paul (16 April 2019). "Notre-Dame: Les vitraux des rosaces ont survécu à l'incendie". Huffington Post France (in French). Retrieved 16 April 2019. ^ "Clôture du chœur" (in French). Notre Dame de Paris. ^ Hartley-Parkinson, Richard (16 April 2019). "Notre Dame crown of thorns and St Louis tunic saved from cathedral fire". Metro. Retrieved 16 April 2019. ^ a b c Lough, Richard; Pineau, Elizabeth (16 April 2019). "No sign of arson in Notre-Dame blaze as nation grieves for symbol". Reuters. Retrieved 16 April 2019. ^ McAuley, James; Whitt, Griff (15 April 2019). "Notre Dame Cathedral spire collapses as Paris monument is consumed by fire". The Washington Post. Archived from the original on 15 April 2019. Retrieved 15 April 2019. ^ "Notre-Dame counts cost as daylight reveals damage". Yahoo! News. Agence France-Presse. 16 April 2019. Retrieved 16 April 2019. ^ ""Paris Is Beheaded": Macron Vows To Rebuild Notre Dame After Horrific Fire; Interior Largely Spared". Zero Hedge. ^ "Fire damage inside Notre Dame Cathedral". NBC4i.com. WCMH. 16 April 2019. ^ a b Marshall, Alex; Stack, Liam; Murphy, Heather (15 April 2019). "Notre-Dame: Fate of Priceless Cultural Treasures Uncertain". The New York Times. ISSN 0362-4331. Retrieved 16 April 2019. ^ "L'orgue principal de Notre-Dame de Paris miraculeusement préservé" (in French). Europe 1. 16 April 2019. Retrieved 16 April 2019. ^ "Notre-Dame de Paris : une enquête a été ouverte pour "destruction involontaire par incendie"". La Provence (in French). 15 April 2019. Retrieved 15 April 2019. ^ a b c "The Latest: French leader vows to rebuild damaged Notre Dame". AP News. 15 April 2019. Archived from the original on 15 April 2019. Retrieved 15 April 2019. ^ a b "Notre-Dame : la piste accidentelle privilégiée, les ouvriers du chantier entendus en pleine nuit" [Notre-Dame: prioritized accident investigation, construction workers heard in the middle of the night]. La Depeche (in French). Retrieved 16 April 2019. ^ a b Captain, Sean (15 April 2019). "Notre-Dame fire: Why historic restorations keep going up in flames". Fast Company. ^ Ganezer, David (April 17, 2019). "Roofer or Welder Starts Fire at Notre Dame de Paris, Building Seems Intact, but Heavily Damages". Santa Monica Observer. Retrieved April 18, 2019. ^ Morris, James (18 April 2019). "Notre Dame fire: Cathedral blaze was most likely caused by electrical short circuit, police official says". Evening Standard. Retrieved 18 April 2019. ^ Diebelius, Georgia (18 April 2019). "Notre Dame cathedral fire was 'caused by electrical short circuit'". Metro. Retrieved 18 April 2019. ^ Chakraborty, Barnini (18 April 2019). "Notre Dame fire likely caused by electrical short-circuit, investigators believe". Fox News. Retrieved 18 April 2019. ^ "French President Macron postpones TV address amid Notre-Dame fire". France 24. 15 April 2019. Archived from the original on 15 April 2019. Retrieved 17 April 2019. ^ Gray, Andrew (15 April 2019). "Macron postpones speech after Notre Dame fire". Politico. Archived from the original on 15 April 2019. Retrieved 15 April 2019. ^ Kirby, Jen (15 April 2019). "Notre Dame Cathedral, one of Paris's most iconic landmarks, is in flames". Vox. Archived from the original on 15 April 2019. Retrieved 15 April 2019. ^ Jarvis, Jacob (15 April 2019). "Notre Dame fire: Huge fire breaks out at world famous cathedral and sends smoke billowing across Paris". London Evening Standard. Retrieved 15 April 2019. ^ a b Damgé, Mathilde; Dagorn, Gary; Durand, Anne-Aël (16 April 2019). "Nantes, Lunéville, Windsor... les derniers grands incendies de bâtiments historiques". Le Monde (in French). Retrieved 17 April 2019. ^ "Queen Elizabeth says deeply saddened by Notre Dame blaze". Reuters. 16 April 2019. ^ "Shock, prayers around the world for Notre Dame Cathedral". AP News. 15 April 2019. Archived from the original on 15 April 2019. Retrieved 15 April 2019. ^ "Every damage to Notre-Dame is a painful wound not only to French people, but to the people of Europe". Focus (in Bulgarian). 15 April 2019. ^ "Orbán expresses sympathies over Notre Dame fire". Hungary Matters. Retrieved 17 April 2019. ^ "Η δήλωση Τσίπρα για την Παναγία των Παρισίων". Η Εφημερίδα των Συντακτών (in Greek). Retrieved 16 April 2019. ^ Hinnant, Lori. "Roof and spire collapse as fire engulfs Notre-Dame Cathedral in Paris". Citytv. ^ Trudeau, Justin [@JustinTrudeau] (15 April 2019). "Absolutely heartbreaking to see the Notre-Dame Cathedral in flames. Canadians are thinking of our friends in France as you fight this devastating fire" (Tweet). Archived from the original on 15 April 2019 – via Twitter. ^ "Message to Emmanuel Macron". Russian Presidential Executive Office. 16 April 2019. Retrieved 16 April 2019. ^ "Xi sends condolence to Macron over Notre Dame fire". Xinhua News Agency. 16 April 2019. Retrieved 16 April 2019. ^ "Notre Dame Cathedral fire: Akufo-Addo comiserates with France". Graphic Online. 16 April 2019. Retrieved 17 April 2019. ^ "Paris archbishop, Holy See call for prayer as Notre-Dame burns". Catholic Voice. Catholic News Agency. 16 April 2019. Retrieved 16 April 2019. ^ "UNESCO to assist reconstruction of Notre Dame post blaze". Business Standard. 17 April 2019. ^ "British restoration experts eager to help 'resurrect' Notre Dame after fire". Jersey Evening Post. 16 April 2019. ^ Watkins, Devin (16 April 2019). "Notre Dame fire: Pope joins Paris in sorrow, Vatican offers technical expertise". Vatican Media. ^ Blamont, Matthias; de Clercq, Geert (16 April 2019). "In the heart of Paris, a wounded Notre-Dame stirs emotions". Reuters. Retrieved 16 April 2019. ^ "Parisians sing hymns as they watch Notre Dame burning – video". The Guardian. Reuters/AP. 16 April 2019. ^ "Stunning video shows people singing hymn to honor Notre Dame as it burned". CBS News. ^ Collins, Lauren (April 15, 2019). "On the Roof of Notre-Dame, Before It Burned". The New Yorker. Retrieved April 18, 2019. ^ Chrisafis, Angelique; Henley, Jon (16 April 2019). "Notre Dame fire: Macron pledges to rebuild devastated Paris cathedral". The Guardian. ISSN 0261-3077. Retrieved 16 April 2019. ^ a b Ott, Haley (16 April 2019). "Why an expert says it could take 40 years to rebuild Notre Dame". CBS News. Retrieved 17 April 2019. ^ a b Hussain, Noor Zainab; Arnold, Paul (16 April 2019). "Insurers expect France to bear Notre-Dame rebuilding cost". Reuters. Retrieved 16 April 2019. ^ Lam, Kristin; Miller, Ryan W.; Rice, Doyle (16 April 2019). "What's next for Notre Dame? Rebuilding. Macron said do it in five years, but it could take decades". USA Today. Retrieved 16 April 2019. ^ "Notre-Dame: la mairie de Paris débloque 50 millions d'euros". Le Figaro (in French). Agence France-Presse. 16 April 2019. Retrieved 16 April 2019. ^ a b Gabriele, Matthew. "Perspective: Fire was the scourge of medieval cathedrals. But they rebuilt from the ashes". Washington Post. ^ Brockell, Gillian (16 April 2019). "How Victor Hugo's hunchback of Notre Dame saved the cathedral from ruin in the 1800s". The Independent. ^ Mondschein, Ken. "Medievalisms: Notre-Dame Cathedral and the Re-creation of the French Past". www.medievalists.net. ^ Kar-Gupta, Sudip (April 18, 2019). "Steelmaker ArcelorMittal to offer steel for Notre-Dame Cathedral restoration". Reuters. Retrieved April 18, 2019. ^ Jackson, Patrick (18 April 2019). "How new tech might help Notre-Dame rebuild". ^ Ott, Haley. "Why an expert says it could take 40 years to rebuild Notre Dame". www.cbsnews.com. ^ Clarke, Joseph L. "Opinion: The reconstruction of Notre-Dame is not the only answer". ^ Lenoir, Luc (16 April 2019). "Notre-Dame: près de 700 millions d'euros déjà donnés par les entreprises et les grandes fortunes". Le Figaro (in French). Agence France-Presse. ^ "Billionaire Arnault's family and LVMH to donate 200 mln euros for Paris' Notre-Dame". Reuters. 16 April 2019. Retrieved 16 April 2019. ^ "Notre-Dame : LVMH et la famille Arnault annoncent un « don de 200 millions d'euros »". Le Figaro (in French). 16 April 2019. ^ "Incendie à Notre-Dame : la famille Pinault débloque 100 millions d'euros". Le Figaro (in French). 16 April 2019. ^ "France-Total fait un don de 100 millions d'euros pour Notre-Dame de Paris". Le Figaro (in French). 16 April 2019. Retrieved 16 April 2019. ^ "Notre-Dame: la mairie de Paris débloque 50 millions d'euros". courrier-picard.fr (in French). Retrieved 16 April 2019. ^ a b c d "Notre-Dame de Paris : cagnottes, promesses de dons et souscription nationale pour financer la reconstruction". Le Monde (in French). 16 April 2019. Retrieved 16 April 2019. ^ "BNP Paribas, SocGen Join Notre Dame Donor List as Pledges Exceed $790 Million". Market Screener. Retrieved 17 April 2019. ^ "Le secteur privé promet près de 700 millions d'euros pour reconstruire Notre-Dame". Boursorama (in French). Retrieved 16 April 2019. ^ a b "Plus de 800 millions d'euros de dons pour la reconstruction de Notre-Dame". 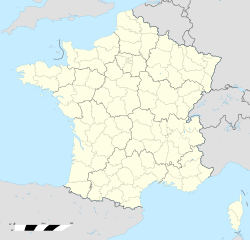 Les Dernières Nouvelles d'Alsace (in French). Retrieved 16 April 2019. ^ "Entreprises et grandes fortunes se mobilisent pour la reconstruction de Notre-Dame". La Croix (in French). 16 April 2019. ISSN 0242-6056. Retrieved 16 April 2019. 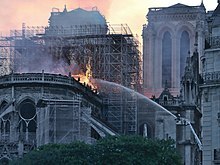 ^ a b "Le secteur privé promet autour de 700 millions d'euros pour reconstruire Notre-Dame". Boursorama (in French). 16 April 2019. ^ "The Walt Disney Company Pledges $5 Million to Support Rebuilding of Notre-Dame Cathedral". The Walt Disney Company. 17 April 2019. Retrieved 17 April 2019. ^ Gray, Sarah; Ma, Alexandra; Martin, Will. "France's superrich join together to pledge over $675 million to help rebuild Notre-Dame, as donations flood in to save the devastated cathedral". Insider. Retrieved 17 April 2019. ^ "Notre-Dame de Paris : la région Auvergne-Rhône-Alpes va verser deux millions d'euros pour la reconstruction" (in French). France Bleu. 16 April 2019. Retrieved 16 April 2019. ^ "En Occitanie, les collectivités se mobilisent pour la reconstruction de Notre-Dame-de-Paris". ToulÉco (in French). 16 April 2019. Retrieved 16 April 2019. 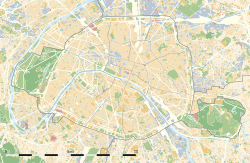 ^ "Patrimoine – La Fondation Michelin se mobilise pour la reconstruction de Notre-Dame de Paris". La Montagne (in French). Retrieved 16 April 2019. ^ "Compania UI Path, „primul unicorn românesc", donează un milion de euro pentru reconstrucția catedralei Notre Dame: „Datorăm mult Franței și culturii franceze. E momentul să dăm ceva înapoi"". Republica.ro (in Romanian). Retrieved 17 April 2019. ^ Gach, Ethan (17 April 2019). "Ubisoft Pledges More Than $500,000 To The Notre-Dame Cathedral Restoration Effort". Kotaku. Retrieved 17 April 2019. ^ Hartocollis, Anemona (16 April 2019). "Notre Dame, the University, Knows What It's Like to Be Devastated by Fire". The New York Times. Retrieved 16 April 2019. ^ "SRO contributes €50,000 towards Notre-Dame restoration". RACER. 16 April 2019. Retrieved 17 April 2019. ^ "Notre-Dame: plus de 800 millions d'euros déjà donnés par les entreprises et les grandes fortunes". Le Figaro (in French). Retrieved 16 April 2019. ^ Soisson, Lucy Handley, Isabel (16 April 2019). "Apple joins French firms in pledging millions to rebuild Notre Dame after fire". CNBC. Retrieved 17 April 2019. ^ Cook, Tim (16 April 2019). "We are heartbroken for the French people and those around the world for whom Notre Dame is a symbol of hope. Relieved that everyone is safe. Apple will be donating to the rebuilding efforts to help restore Notre Dame's precious heritage for future generations". @tim_cook. Retrieved 18 April 2019. ^ "Tweet from Autodesk CEO Andrew Anagnost". 16 April 2019.